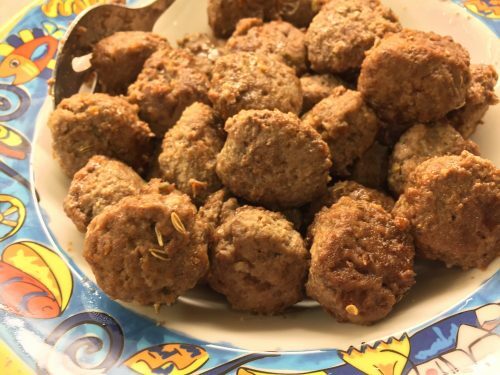 Published on April 30, 2018 in Recipes. 0 Comments Tags: Breakfast, breakfast bars, cookie bar, dessert. Published on April 8, 2018 in Recipes. 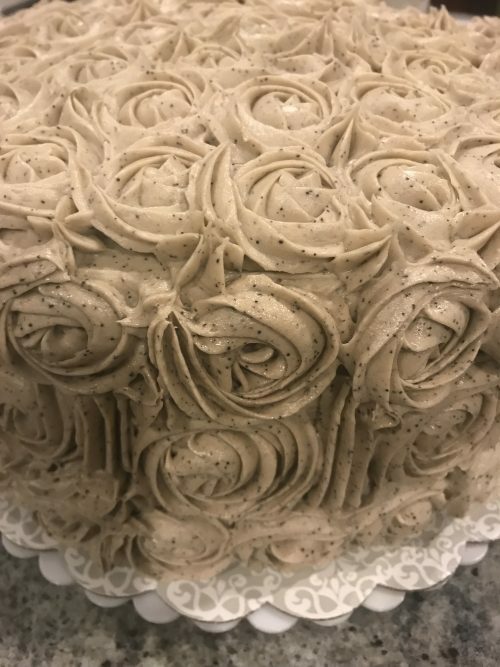 1 Comment Tags: chocolate, Cinnamon Kahlua Chocolate Cake, Suitcase Cake. 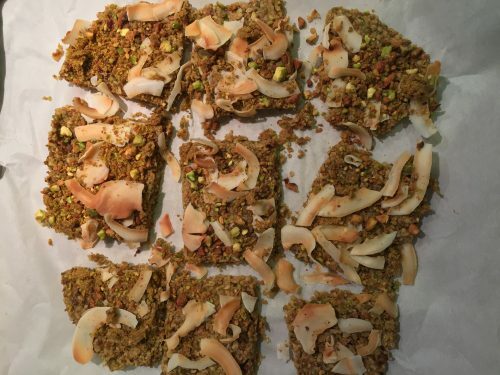 Published on March 20, 2018 in Recipes. 0 Comments Tags: Dinner, meatballs. Published on January 21, 2018 in Recipes. 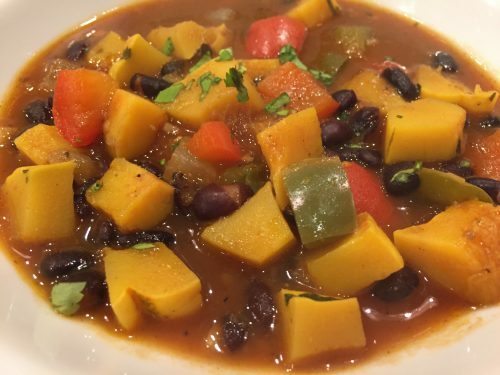 0 Comments Tags: chili, squash, vegan. There is a quiet Saturday morning space that I’ve discovered. I find it in the alcoves of the sun trying to push its way through the slatted blinds on a cold winter morning. The house is asleep; the neighborhood farm animals are tucked into the cozy spaces, and aside from the humming of the heater as it takes the chill out of the house, there is absence of sound. Published on January 15, 2018 in Recipes. 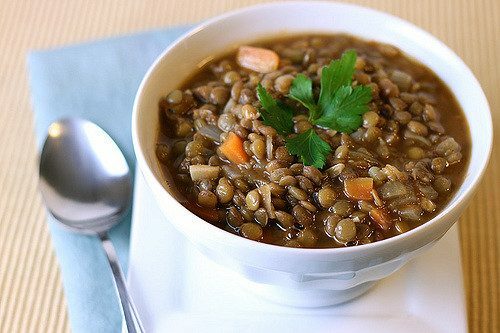 0 Comments Tags: lentil, soup, vegan. There are just certain facts about yourself that are known entities. For example, I’ve always hated mushy cooked carrots (unless they are sweetening up a soup). I function most effectively with everything in its place. My favorite drink is a Negroni; I refuse to pick a favorite color. Chocolate is my favorite food group. Spending time with people I enjoy is always an option. And I have a passion for photos that cannot be satiated. It’s just a fact. I love pictures; I always have. And if you were to scroll through my photo roll on my phone camera you would find that nearly 1/3 of them are food photos. Published on December 31, 2017 in Recipes. 0 Comments Tags: carmel corn, dessert, Snack, sweet. 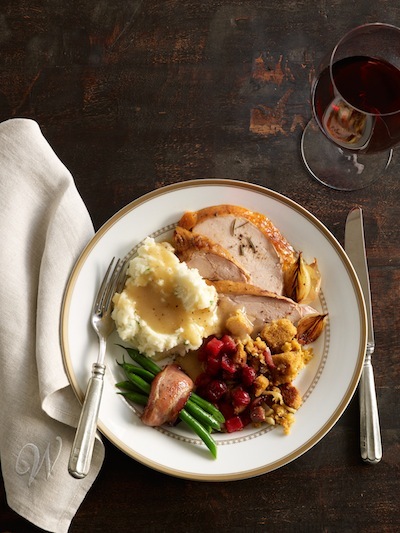 The holiday season brings with it heaps of food memories. For me, the smells and tastes are triggers. 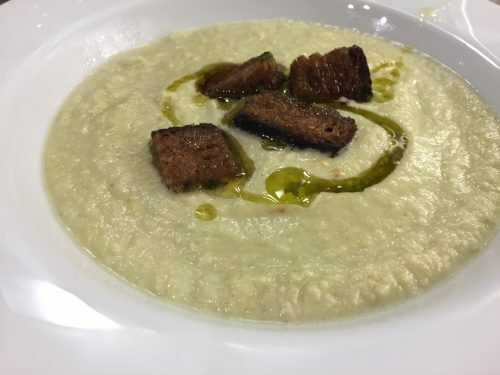 As we work our way through so many of the traditional Sicilian dishes that have been passed down from generation to generation, I feel blessed and cursed. Blessed to have a family so very steeped in traditions in their love of food and cursed that these time intensive delicacies rob me of what little free time I have. There is certainly joy in finding time to cook with my Aunt, Cousin and my Mother, but there is so much pressure to get things done for the big day. My husband and I are both products of divorced families. As children, having multiple Christmases has its silver lining – seemingly infinite gifts. As adults, the silver lining can sometimes be overwhelming – driving, shopping, cooking (repeat x 4). I end up feeling energy depleted and trying to figure out how I might lighten the load next year. There is no sugar coating it; four Christmases is A LOT to be merry about. That’s not to say that each celebration is not coveted and special; I love them all. We all do. And we love all of the nice interactions with family and extended family and friends. Yet this year I think I reached my saturation level. I’ve declared that next year I will take the year off. I want to truly appreciate how special it all is, and in order to do that I need to be able to have a holiday where I can just relax. As I shared this with our families the response was very mixed if not perplexed. Even my children were wondering why such measures would be necessary. The reason is simple. I’d like next Christmas to be different. Not complicated or time consuming but indulgent. I am not looking for an epic adventure, just long lazy days, a book and a walk on the beach followed by some festive red cocktail as we head out to dinner. So I’ve got a dream. Let’s see if I can make it happen. As we head into these final days of 2017, I am making my wish and resolution list and I am going to be a bit selfish with how I spend my time in 2018. For those interested in a preview (or inspiration) this is what my list is starting to look like. 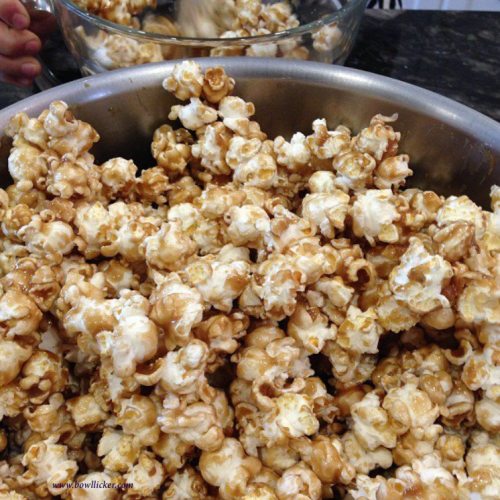 This easy Caramel Popcorn is the perfect salty/sweet combo! It starts with fluffy, freshly popped popcorn then it is glazed with real butter and decadent brown sugar, and nuts of your choice — pieces of almonds, cashews and/or pecans make for an irresistible crunch. Put popped corn and nuts into large bowl and set aside. Preheat oven to 200 degrees. Boil sugar, butter, syrup and salt for 5 minutes. Remove from heat and add in baking soda. Stir well over popped corn and nuts. Spread on a baking sheet and bake for 1 hour, stirring in 15 minute intervals. Remove from oven and cool then store in air tight container. Published on December 24, 2017 in Recipes. 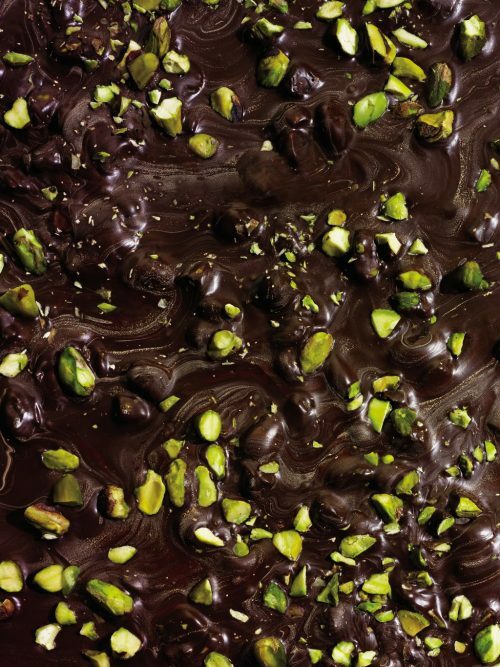 0 Comments Tags: chocolate, Christmas song, dessert, Holiday gift, pistachio. Published on November 6, 2017 in Recipes. 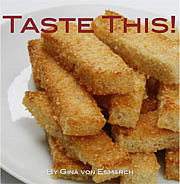 0 Comments Tags: appetizer, canning, pickled, vegetarian. October, formerly one of my favorite times of year, seems to trigger a ‘hunger games’ type of reaction from my very being. As the month approaches I feel a duplicative sense of anxiety and accomplishment. Two years ago, during Breast Cancer Awareness month, I was diagnosed with breast cancer. What unravels after that is a bizarre concoction of one part sanity, one part disbelief mixed with two heavy doses of fear. In my moments of clarity my goal was to make sure things were in order, smart decisions were made and that at all costs I protected those closest to me. In retrospect, I can tell you that having a goal did work. I was luckier than many, and I managed to keep my anti-joiner resolve. I may have had to go done this path, but I did it my way. I refused to be defined by this illness – pink bows >no thank you<, hugs and long stares, wondering how I am REALLY doing >avoided at all costs<, and should anyone dare to call me a hero/warrior >I ran for the hills<. Okay, I am joking, to an extent. I sincerely did appreciate how much people cared, and my inability to share my dark places with them was just a defect of me, being me. In many ways I wanted to press the fast forward button, and perhaps by not discussing it I was able to minimize some of the more scary elements. Why bother discussing something that stripped away some of my memories and gave battle scars my family? It is the past, I am fine. And yet unceremonious revelations abound by the day. My tell tale signs of its aftermath are different than what I would have anticipated. For example, I appreciate the value of a smile, taking the time to laugh, a conversation that goes beyond what you may or may know about me on social media. I want to have fun; I want to feel alive; I want to just be happy. I want to spend time with people. I know this probably seems simple and hardly profound. There are other signs that I’ve changed. I feel as if I’ve been to the dark side and back, and oddly enough, now I find that I gravitate towards natural light. Literally. In fact I crave it. I can’t seem to keep curtains or doors closed – I want the natural light to shine in. I my measure success by being able to help others. I want to give back to those that are the difference in my world. I want to do all of those little things that make life memorable. Food is something at the top of my list on how to keep things special and memorable. It is not that I am the only good cook in my house, it is more about my passion for it. It is the gift of my time. As summer slipped into fall, I thought it might be nice to put the end of summer flavors in a jar. Ergo, another metaphor for light. Pucker Up. 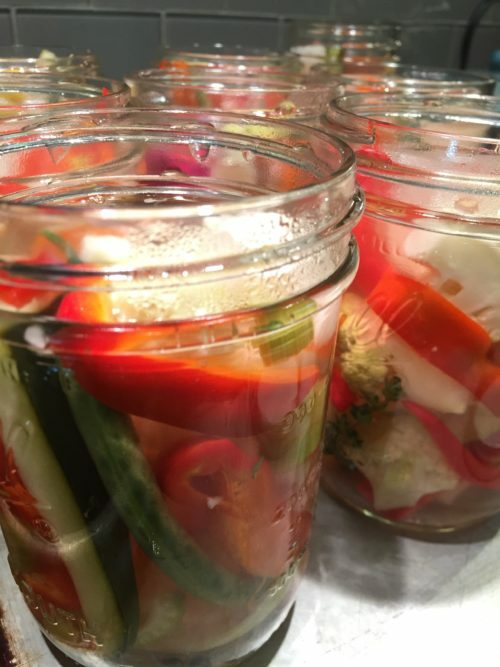 Pickling is one of those magical preservation methods that not only extends a food’s shelf life, but also takes its flavor profile to interesting and delicious places. Cucumbers aren’t the only thing that can be pickled. 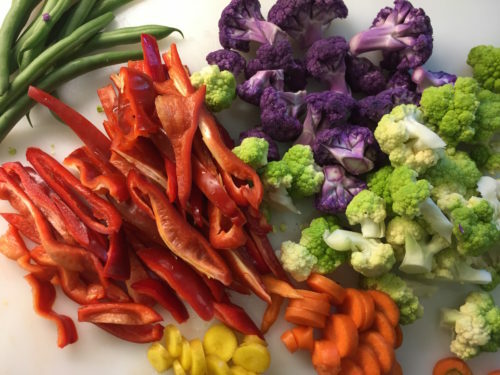 These very robust flavored veggies have a nice garlic taste and a hint of sour vinegar tang. 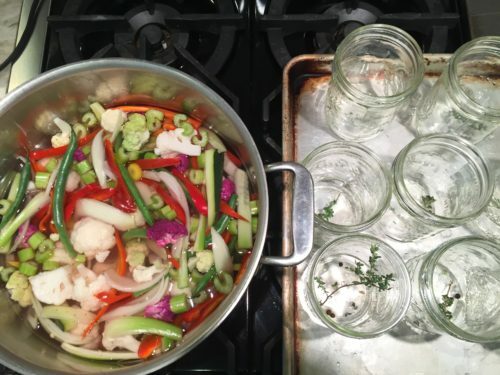 It’s high pickling season, so pull out those mason jars and get to work! 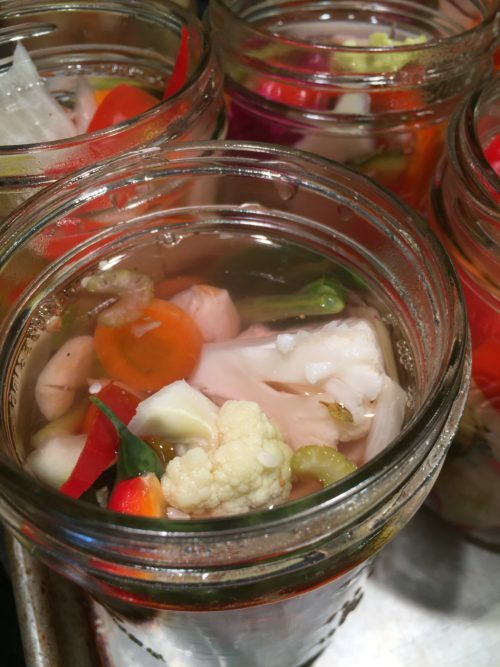 Giardiniera, or sottaceti, are colorful pickled vegetables that make a beautiful accompaniment to a charcuterie plate or can be added to rice or salad dishes. Note: I made the full recipe and then jarred half of it before adding in the jalapeño. Note: you can also conserve the vegetables by storing the mixture in oil rather than vinegar, which will keep the flavor balanced. Clean and prepare the vegetables. 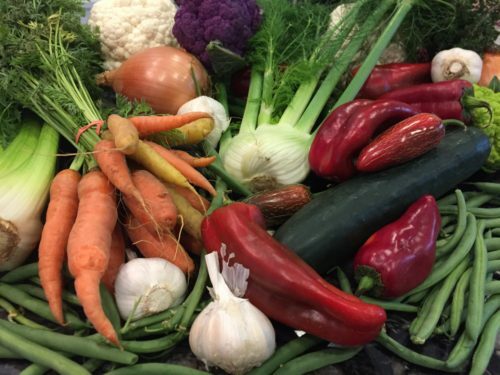 Vegetables like the celery, zucchini and peppers can be cut into strips while cauliflower should be cut into sizes that will easily fit into a jar, about the size of walnut. For variety, cut carrots into round coins. Green beans can be cut in half and onions into small slices. In a large stock pot, add the vinegar, water salt and bring to a boil. 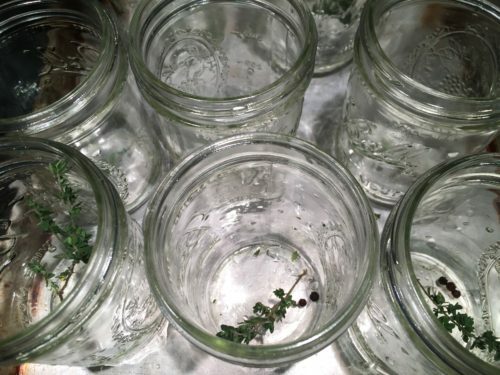 While some recipes will suggest that you cook each separately in the vegetable mixture, I like to mix the remainder of the ingredients together; keeping the thyme aside to place a sprig in each jar. Cook approximately 3 minutes until they are bright and starting to soften but still somewhat crunchy. At this point, the vegetables are ready to be eaten. To prepare them to share at a later date, continue the canning process. 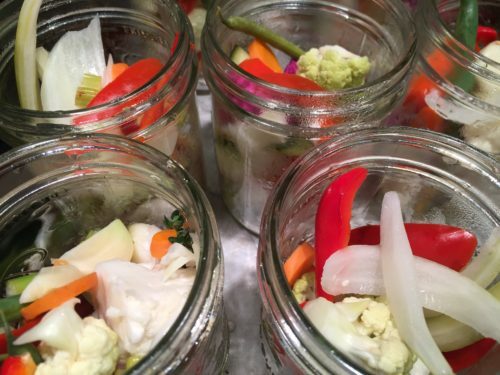 If not canning, vegetables will keep for up to 3 months. 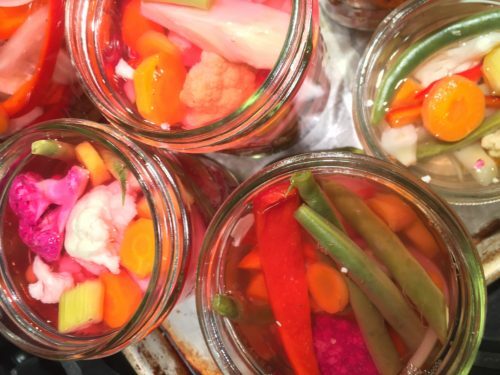 Pack vegetables evenly and colorfully into hot sterilized jars to within a 1/2 inch of top of jar. 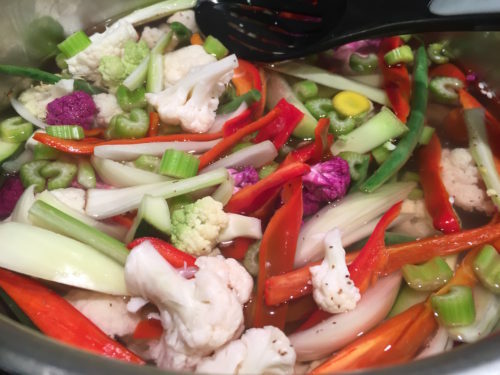 Ladle hot vinegar mixture into jar or add olive oil to cover the vegetables, leaving 1/2 inch headspace. Creating proper headspace in each jar is essential to achieving a proper seal and being able to safely store your jam. This is where the clear plastic ruler comes in handy. Remove any air bubbles by poking down into the mixture with chopstick or skewer. Clean the rim of the jar with a damp paper towel to make sure there’s no stray juice to interfere with the seal. Center lid on jar. Cap the jar with your lid and tighten the screw band until it is fingertip tight. Place the jar back into the boiling water canner using your jar lifter. Once all your jars are filled, make sure they are completely covered with water (you may have to add a bit of additional water to the canner). Bring the water to a boil and then set your timer for 20 minutes. (Add 1 minute onto this time for each 1,000 ft above sea level.) When the timer goes off, remove the canner lid and wait 5 minutes. Why 5 minutes? If you don’t wait a few minutes the jostling of removing them from the canner could keep the jars from sealing. Another important tip is to remember to keep your jars upright as you remove them, titling to the side can also interfere with the seal. There’s nothing more satisfying than hearing “POP!” from across the room and knowing your jars are sealing, but you can’t sit around for a whole day for that sound. In 24 hours go back and check all your jars. If you push down on the top and the lid gives, you didn’t get a solid seal. Immediately refrigerate or reprocess that jar. I usually take it one step further by taking off the screw band and holding the jar up by just its lid (with the other hand ready to catch, of course). If the lid doesn’t spring up and I can hold it up by just the edges of the metal lid, it has a nice seal. Published on October 7, 2017 in Recipes. 0 Comments Tags: Cereal, chocolate chip, cookies, Ginny. I’ve been trying to comfort myself. I haven’t been home much over the past few weeks, as I spent most all of my free time with Ginny. Little did I know two weeks ago that these would be the last two weeks we would be physically together. It’s the kind of realization that leaves me with a difficult to swallow lump in my throat. 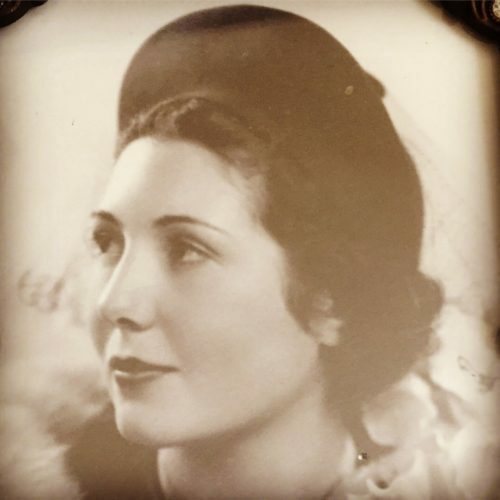 At 104, Ginny (AKA Gram) my paternal grandmother was remarkable. She would be the first to tell you that she had lived a good life and was ready ‘to go’- but somehow that had remained well beyond her control. Since she was in her 90’s I had wondered how I would feel on the day we were no longer together. Little did I know that we were going to be granted 14 more years to enjoy each other’s company during our weekly visits and calls. And while I know it would have been selfish to want more, there was no amount of time that was going to make it easier for me to let her go. I was never going to be ready. I just don’t do ‘good-byes’ gracefully. In retrospect, I realize that everything about me during these past few weeks was trying to find comfort from reality and my emotions. I wanted to dress in only the softest materials – flannel hit the top of my list, and leggings weren’t too far off either. I was constantly craving my favorite comfort foods – and yet none of them satisfied me. In the past, pasta and chocolate could almost always turn the corners of my mouth upwards into a smile, until now. Sleep escaped me and it seemed that music was my only outlet to calm my otherwise inconsolable emotions. I tried to prepare my children for the inevitable as my mother, aunt and step-mother tried to prepare me. My head understood that it was time for Ginny to go but my heart refused to cooperate. Each car ride into San Francisco to see her left me in tears as memories would sneak out of my eyes and rapidly roll down my cheeks. The return ride home was much the same. I thought there might be at least one ‘dry’ day but such a day never materialized. It seemed I was capable of providing an unending supply of tear juice. I haven’t had much of a desire to cook or bake which makes it challenging to be a food blogger. This week I paced around the kitchen in a circular clockwise motion, for the better part of 30 minutes, until I decided that I had to try to crack the seal and figure out how to unlock my suppressed cooking gene. 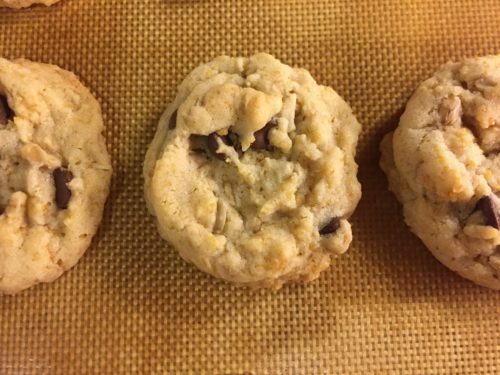 I pulled out my recipe archives and after a lengthy span of time, and several opportunities to be side-tracked, I finally summoned some cookies into the oven. It was not easy. My heart wasn’t in it, but I pushed through to try to find that glimmer of me that has gone suddenly missing. The cookies certainly put smiles on faces around the house and at the office, which was all I could ask for given my state of mind. It confirmed that while I may be momentarily lost in emotions, my baking abilities still work. And I am sure with a bit of food coaxing, time will help me find my stride again. In the process of rediscovering my take on an old-time classic cookie recipe I managed to somehow feel closer to Ginny. 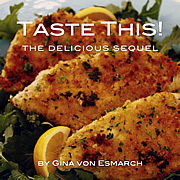 I’ve been searching through my archives and found SO MANY of her amazing recipe creations … and there is one that I can’t wait to make (yes, I am a tease) … which we will discuss soon. Until then, I share with you this crunchy cereal infused chocolate chip cookie. 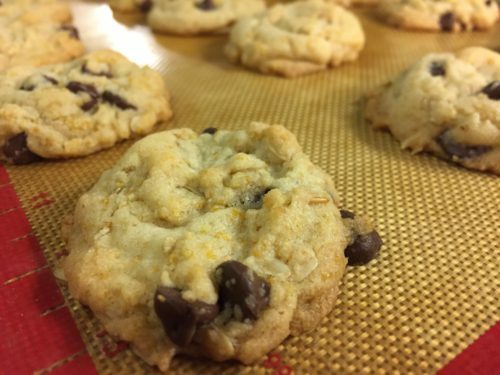 While I typically tend to make chewy chocolate chip cookies there was a time when I was a “tried and true” crunchy cookie gal. 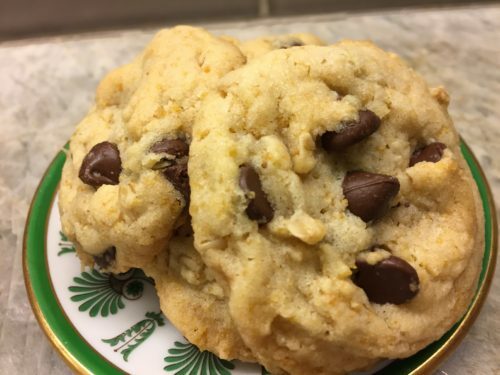 Meet a cookie with some serious texture in its character– and while it is not necessarily a beauty for the eyes to behold, it does the belly good. In a medium size bowl, using a hand mixer, combine butter, sugar, vegetable oil, brown sugar, egg and vanilla together. Add in flour, baking soda and salt and mix well. Lastly add in corn flakes, oatmeal and chocolate chips. Stir by hand until well combined.